Captain Montague's Bed and Breakfast spans an entire block in the historic, lakefront community of Old Plat in Huron, Ohio. Situated under the Waterford chandelier, the large table in the dining room seats ten, and the cozy round table in the alcove seats four. This sunny spot is a favorite of so many of our guests whether eating, playing cards, or just day-dreaming. Our Butler's Pantry is stocked for your comfort and convenience. Help yourselves to teas, bottled water, ice, snacks, sweet treats, and coffee at any time - day or night. Our desire is that you are comfortable here; make this your home away from home. 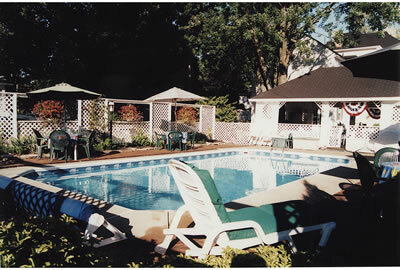 During the summer months breakfast is available in the charming gazebo adjacent to the in-ground swimming pool. Our grounds are beautifully landscaped with plenty of quiet corners to sit and enjoy the warm lake breezes.